I'm writing to you with an offer of listing at one of the major masternodes monitoring website - http://masternodes.plus (MasterNodesPlus). You have been selected and approved for listing as recommended masternode coin. this project has great potential. Convenient management MN. All in one click! 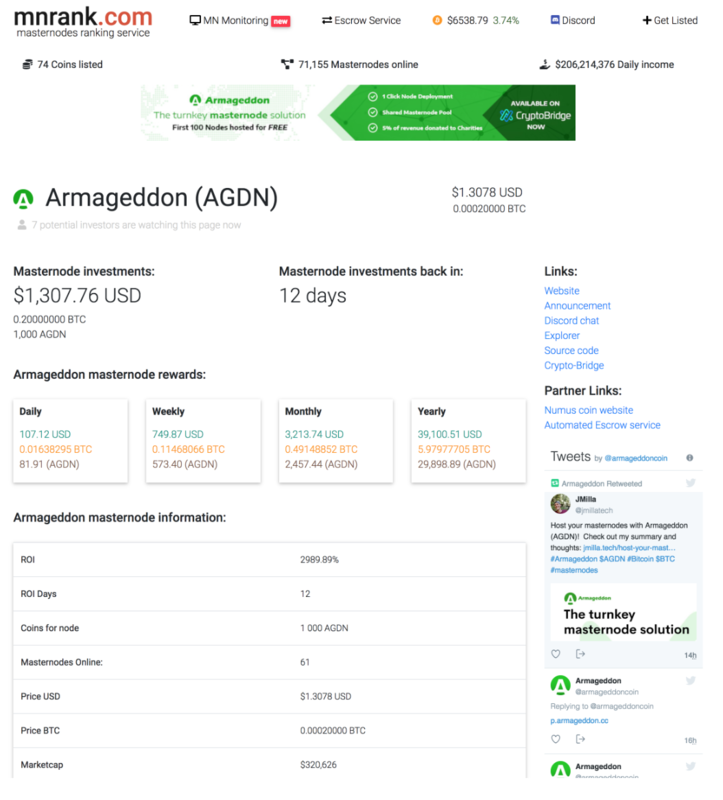 Armageddon is now live on Masternodes.online ! Masternode is getting very famous this year, that's why having a masternode hosting platform would be very helpful to those who want to invest from it. I am not yet a masternode investor but I am trying to understand it well first before I enter this feature. and already a decent trading volume and the price,congratulations, good start..
We also have a live banner ad there as well. We are now listed on Masternode China. You can also see we have 2 banner ads on the homepage! I've been speaking to the devs for a few days and I can see that that they really have vision and the drive to get the job done! We are happy to be listed on their site as an instantly deployable masternode. They have my personal endorsement! 2.700.000 coins without pow....If your project is real,it is VERY VERY NICE! Very interesting! Does your platform have access to a private key? How long does it take to automatically configure? How often will new coins be added? The platform automatically creates and configures the masternode server for you in the background. At certain points you are asked for input that links your wallet to the masternode server. Each masternode server you launch costs 0.30 USD per day (Unless stated otherwise) paid in AGDN at the rate of the launch/renewal time. Are my coins safe with you? Your masternode collateral coins never touch the Armageddon Platform, that's what a cold wallet setup means. Your coins stay in your wallet and you only "prove" they are yours, with info we guide you step by step on obtaining from your wallet. What happens if the Armageddon Platform gets hacked? The worst case scenario is someone gains access to your masternode server, but since no coins are there you are fully protected. How does a coin get added to the Armageddon platform?